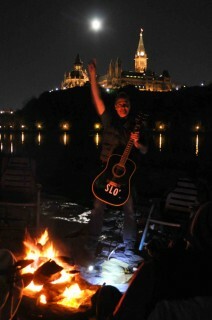 Slo’ Tom goes for the photo op in the shadow of Parliament Hill. Like any good country album, I’m Sick — Stewart’s 3rd album — has its share of tall tales and heartbreak stories. It’s dry and funny like all Slo’ Tom albums, displaying a quirky-bizarro sense of humour with a touch of charm best illustrated by tunes such as Ham & Eggs, Group Home, and Retarded Heart. Stewart wears a number of hats as a musician in the metal band Manpower and in kids-rawk act Hey! Buster. He also mans the soundboard at Zaphod’s and fixes amps at Spaceman Music. He was part of the legendary Ottawa act Furnaceface way back when. Stewart released his first Slo’ Tom album in 2000 called Liquor’s My Lover. 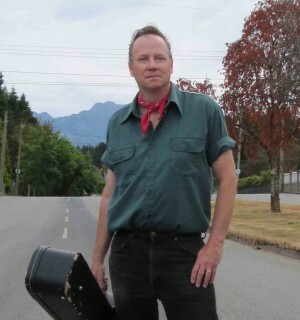 It was recorded lived at The Downstairs Club with his backing band The Horseshit Heroes (Jim Bryson, Geoff Taylor, Graham Collins and Dave Dudley). 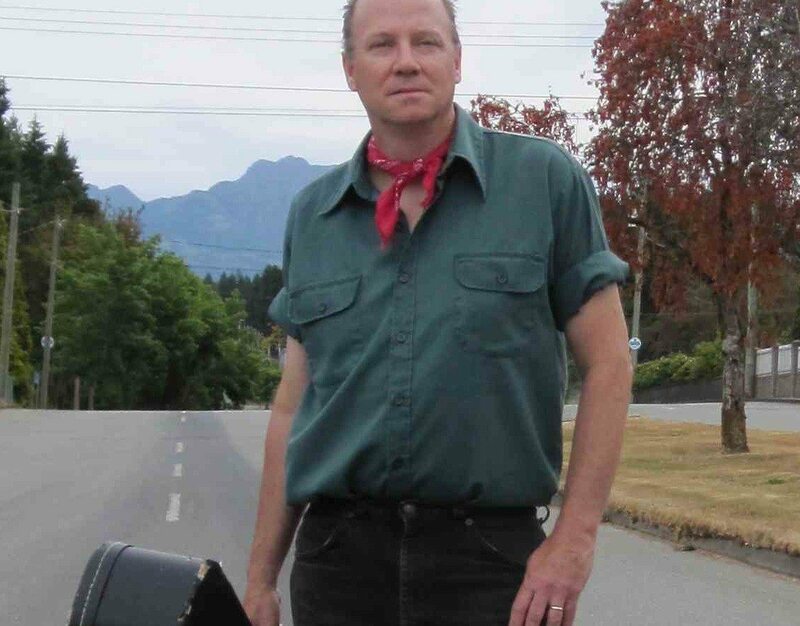 His current band, called The Handsome Devils, is Matt Ouimet (guitar, lap steel, and the album’s producer), John Jed Knoll (drums) and Stephen Martin (bass). They gather annually on the holiday Monday of Victoria Day weekend to record an entire album in a day. It’s Stewart’s goal to release an album a year for the rest of his life and to contribute something a little different to the music scene. Slo’ Tom’s album release party/show takes place Saturday, Oct. 26 at Irene’s Pub. Special guest is Lynn Jackson. $8 at the door. Dad band Hey! Buster plays music for kids. They talk about lice and bedtime and poopy pants with harmonic panache. They’ll play a Halloween Spooktacular show Sunday at the Black Sheep Inn and will play a new song called “I Like My Bike.” It’s the first of many tunes for an eco-themed album that the band is planning — though founding member Sherwood Lumsden assures that the band doesn’t “want to get too far from the booger and peedance material.” They play Sunday, Oct. 27 at 4 p.m. the Black Sheep Inn in Wakefield. The Darcys just released Warring, the bookend of a trilogy for uber-hip label Arts & Crafts. The sonic wallop was inspired by the indulgence of ‘70s studio albums. The Toronto band plays Zaphod Beeblebrox on Saturday, Oct. 26 at 8 p.m.
Kalle Mattson headlines the NAC Presents Series on Friday, Oct. 25 at 7:30 p.m. He plays selections from his new album at the Fourth Stage. It’s a concept record that deals with the death of his mother five years ago when Mattson was just 16. Buzz band The Belle Game play the Black Sheep Inn Thursday, Oct. 24 at 8 p.m. The Vancouver quintet recently released Ritual, Tradition, Habit. AroarA is Andrew Whiteman (Broken Social Scene, Apostle of Hustle) and his spouse, Montreal artist Ariel Engle. The duo’s new album is called In the Pines. It’s based on a poetry collection of the same name by American writer Alice Notley. The band writes about the album concept on their blog and will play the Black Sheep Inn, Friday, Oct. 25 at 8:30 p.m.
GOOD2GO plays with the Velvet Underground cover band No Kinds of Love Friday, Oct. 25 at 9:30 p.m. at Irene’s Pub.